A portly man, seen with hair puffing out from the sides of his cap, was drawn in the San Diego Union Tribune prior to the release of Capitalism: A Love Story. The bespectacled behemoth pictured in the cartoon, of course, was an artist’s representation of the outspoken impresario Michael Moore. The caption read: “Capitalism is a bad thing, said the multimillion dollar director.” Tufts of money sprouted from underneath Moore’s disheveled clothes, looking like thickets of weeds. The highly publicized Moore has been known to stir the pot with a huge spoon, usually in the form of a camera, to make documentaries that often rouse spitfire conversations. Moore’s appearance, which many people poke fun at, is anything but turgid and demanding. If you glanced over the director, you would find his body language to be innocuous, his voice barely holding a demanding note. It’s funny, then, that his work has uprooted so much heated discussion. Moore’s newest opus, Capitalism: A Love Story, is not atypical of the filmmaker’s opinionated servings of celluloid: it is a stylistic flipbook for people who hate documentaries. Moore’s film’s are the antithesis of the unbiased reporting, but, being that as it may, he knows how to spin entertaining movies out of current events; think The History Channel for those who watch Jon Stewart’s The Daily Show. Here, in Moore’s assault on capitalism, he focuses on the welfare of underprivileged citizens of the United States. The direction focuses on the heinous wages of airline pilots; the unjust insurance policies put out by employers; and the massive implosion of the country’s economy. Some of the testimonials, taken from politicians with plumes of gray hair and crisp suits, make for interesting dialogue. Others, like Moore’s dinner sit-down with Princess Bride actor Wallace Shawn, seem to be lazy choices for interviewees. Nonetheless, the fast editing, which shreds by with ballistic enthusiasm, makes you forget these faults by supplying you with entertaining factoids and humorous archival footage. There is your obligatory George Bush bashing, and, as an additional measure, you’ll get your garden variety of daffy quotes from the marble-mouthed Texan. Needless to say, I don’t think that Republicans will be bum rushing theatre doors on a Friday night to get into Capitalism: A Love Story. None of this information is big news, but Moore doesn’t care. Watching the Flint-born director, in the two-hour film, expose the heads of money hungry corporations with a seemingly carefree swagger is enough to make most people crack a vengeful grin. The film’s narrative paints the higher class as people who clutch at coins so hard that they break their own fingers in the process. And Moore’s finger wagging even goes as far as to point at his own family. 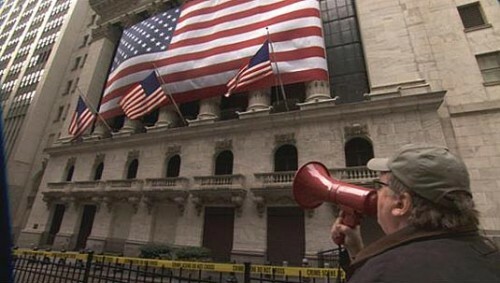 The best parts of the film occur when Moore, camera behind him, attempts to speak with bubble gum mashing stock market executives. There isn’t much surprise when this type of behavior, especially later in the film, gets him escorted out of several high-profile areas. The theme of opponents swatting Moore’s inquisitive camera lens away from their faces is pretty prevalent in the bulk of the film. Other times, the documentary interviews crestfallen members of poor working class households, showing their heads tilted down, hair draped over their faces like a sort of makeshift veil. Moore, at a certain point of the film, practically begs his audience members to join him on a quest for good; he suggests that his energy is waning. One wonders if Moore is really a white knight, one whose armor is dinged up, tainted, and rusted at the bolts. The man isn’t a glamorous hero, as his mussed hair and goggle-sized glasses tell you, but he believes that he is. And if you hate him, that’s fine. Only be aware that, despite your political allegiances, he is one hell of an entertainer.